I rolled 1d20+7, the result is 15, 7 = 22. See, a 22 is a nice solid hit. That 10 damage is going to drop the sword as well. Monster 5 goes. You can't see him, so you don't know what he's doing, which means that it is functionally Caleb's turn. Caleb can't see any monsters at the moment. I'll post an updated map around mid-day, but it's going to look very similar to the current map unless someone does something about all this darkness. A note on duration of Bless - the image I just posted should indicate there are only 8 more rounds of bless remaining on each of the affected characters, rather than 9. Has anyone in the party taken damage? Edit - I know Brianna is bloodied (which means below half hit points). Has anyone else been hit but is not currently bloodied? Yes - Eryndir and Prythurkan are both wounded but not bloodied. Everyone else looks fairly okay. Caleb's light spell should still be active, since it's probably been less than an hour since the last combat. If not, he will cast it again before advancing four squares toward the monk. If it's still in effect, he will dash forward instead, moving 40'; with the caveat that if whatever is moving around in the darkness enters his field of vision, he will stop. It is still active. Is he taking the "dash" action or are you being illustrative? I rolled 1d20, the result is 11 = 11. He will move as slowly and methodically as possible while taking the "dash" action. Caleb wouldn't embarrass himself in mixed company. It looks like a suit of full plate. But its moving. Ok. If you took the Dash action, you still have your move action left. If you took your move action, you would have a standard action left. It makes the most sense to just take your move here, so are you going to take a standard or pass? That makes sense. Now that he sees an enemy, he will use his standard action to Dodge. Bird pulls out a flask of alchemists fire. He looks at the interior of the wooden ship and looks back to the flask. When his beak opens, a sound like a timber cracking as it burns comes out. Something happens in the darkness. Kairon looks at Bird and yells: "No flames, you'll kill us all!" 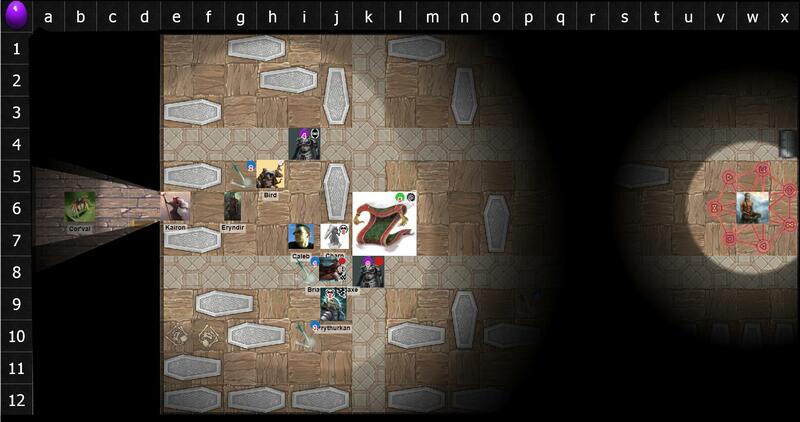 She then moves to F6, launches a spear of eldritch energy at the animated armor Caleb revealed, then retreats to G5. I rolled 1d20+5, the result is 18, 5 = 23. I rolled 1d10+3, the result is 9, 3 = 12. Kairon nails the armor with her cantrip. Eryndir will begin by using his Cunning Action to Dash. He will move H7, I7, J7, K6, L6, M6, N6. (35 Feet.) He will lay the torch he is carrying on the casket in O6, and then use his normal movement to go M5, L4, K3. He will gesture to the casket in J3 and say "There is something stirring in here! The mist is animating the obects!" Then he will use his standard action to Attack the animated suit of armor with a shot from his bow. I rolled 1d20+5, the result is 5, 5 = 10. Is there any type of check that can allow us to determine how these objects are animating, while things like the chest we opened or the rum we found didn't? Or the objects we carried? None of the skills checks could be done in combat to figure out these details. Spending some time analyzing the magical reanimation could yield results if you were to dedicate between 10 minutes and a few hours to the effort, depending on how you conducted your research. Briana moves to J8 and dodges. Prythurkan moves to J9 and dodges. Darusthanav moves to D12 and hides. It is now Charn's turn. I can post an updated map this afternoon. Able is spending the time in combat beginning to evaluate this. He assumes a pose not unlike the monk as he begins evaluating the evidence to this point. Charn moves to J7 and readies an action to swat the first enemy that gets into melee range. I rolled 1d20+2, the result is 13, 2 = 15. I rolled 1d20+2, the result is 11, 2 = 13. I rolled 1d20+2, the result is 3, 2 = 5. A massive suit of armor lurches forward and attacks Brianna. This trigger's Charn's readied action. The suit of armor will survive and attack Brianna. As it does, Cor'val watches as several other swords and a rug begin to animate as well. I rolled 1d20+4, the result is 8, 4 = 12. I rolled 1d20+4, the result is 11, 4 = 15. Brutal. Brianna gets slammed twice by the animated armor. I rolled 1d6+2, the result is 3, 2 = 5. I rolled 1d6+2, the result is 1, 2 = 3. Ouch. Brianna is now bleeding out. It is now Cor'val's turn. Whoopsie. I'll be editing the IC comment so the map isn't ginormous. Charn gets his attack. Cor'val can assume Charn won't kill the armor. Since Brianna is downed, can Cor'val fire through her square without issue? If so, he'll move to G8 and fire on the armor. If not, he'll move to G5 and fire on the rug. I rolled 1d20+7, the result is 20, 7 = 27. I rolled 1d8+3, the result is 5, 3 = 8. I rolled 1d8, the result is 6 = 6. You can always shoot through your allies. With that much damage, you can probably literally shoot THROUGH your enemies. Once Charn rolls his readied action, I'll run the rug, and it'll be Caleb. Dice, don't fail me now! I rolled 1d8+3, the result is 1, 3 = 4. You should buy new dice. The rug attempts to smother Charn. This is a special attack that doesn't use the ordinary grappling rules. I rolled 1d20+5, the result is 10, 5 = 15. I rolled 2d6+3, the result is 6, 5, 3 = 14. The rug is unable to get a hold of Charn. It now occupies K6, K7, L6, and L7 as it is a very large rug. It is now Caleb's turn. There are 7 rounds of Bless remaining on Charn, Prythurkan, and Brianna. Also, Charn, the armor's AC is more than 14, so remembering your Bless wouldn't do much. Caleb will move one square to stand directly behind Charn, diagonal to Brianna. He raises his holy symbol and casts spare the dying, leaning down to touch her and offer a prayer. "Think of the roads!" Brianna thinks of the roads and is no longer bleeding out. Bird moves to H5 and throws a vial of acid at the armor and the rug. They must make Dexterity Saves. I rolled 1d20+0, the result is 7 = 7. I rolled 1d6, the result is 3 = 3. The rug is shockingly resistant to acid, but the armor is not doing well. It's bloodied. I'm not sure what bloodied animated armor looks like, but I do know that Cor'val managed to stick an arrow in it's eye socket. Another set of armor erupts from the coffin in J3, steps to I4, and attacks Bird. I rolled 1d20+4, the result is 7, 4 = 11. I rolled 1d20+4, the result is 4, 4 = 8. I rolled 1d6+2, the result is 6, 2 = 8. Bird is a dodgy Kenku and is unharmed. Flying Sword 1 moves to I8. It attempts to attack the prone form of Briana. This would give it advantage. Briana did take the Dodge action last round, but Dodge goes away if you drop to zero. However, I am a filthy, filthy cheater and didn't give Briana the benefit of the dodge action against the Animated Armor's multi-attack that dropped her. Briana should have had the benefit of putting those attacks at disadvantage, and I'll attempt to rectify that here. I'll re-roll the armor attacks. Ok, Briana went down anyway, so I feel somewhat better. The Sword will now attempt to kill her, with advantage because she is prone. I rolled 1d20+3, the result is 18, 3 = 21. I rolled 1d20+3, the result is 14, 3 = 17. I rolled 1d8+1, the result is 2, 1 = 3. The sword fails to crit but it does damage her. She suffers a Death Saving Throw failure and is now bleeding out. Flying Sword 2 flies to G5 and swings on Eryndir. I rolled 1d20+3, the result is 5, 3 = 8. I rolled 1d8+1, the result is 5, 1 = 6. Flying sword 3 flies to I10 and now flanks Prythurkan with the Animated Armor. It attacks, with advantage. I rolled 1d20+3, the result is 2, 3 = 5. I rolled 1d20+3, the result is 19, 3 = 22. I rolled 1d8+1, the result is 3, 1 = 4. Prythurkan is scratched by the blade, which manages to nick him just above the right ear. Kairon advances to E6. She casts Faerie Fire, targeting I7 down to I10, and I7 over to L7. 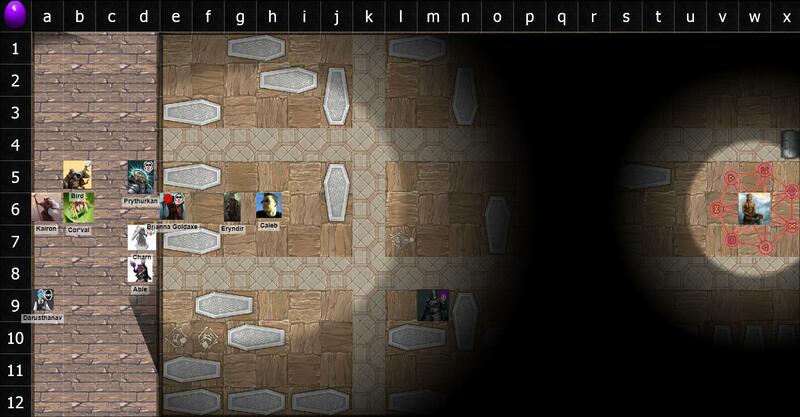 This targets Caleb, Charn, the Rug, Armor 0, Sword 1, Sword 3, Brianna, and Prythurkan. She yells: "Attack the lit ones now!" I need Dexterity saving throws from Caleb and Charn. I rolled 1d20+2, the result is 19, 2 = 21. I rolled 1d20+2, the result is 16, 2 = 18. I rolled 1d20+2, the result is 14, 2 = 16. I rolled 1d20+0, the result is 17 = 17. I rolled 1d20+0, the result is 10 = 10. I rolled 1d20+1, the result is 14, 1 = 15. Given how incredibly poorly that Faerie Fire went, Kairon immediately drops concentrating on the spell. The only NPC briefly illuminated by the spell was Brianna. Charn and Caleb can roll Dexterity saves if they want, DC 14, but it totally doesn't matter. Kairon will forever remember this embarrassment unless targeted by the Feeblemind spell or a similar effect. Able is in D8, in Darkness. Darusthanav is in D12, in Darkness. Eryndir will use 10 feet of movement to climb onto the casket in F5, and will then attempt to hit the animated sword with his rapier, gaining advantage by flanking with Bird. I rolled 1d20+5, the result is 4, 5 = 9. I rolled 1d8+3, the result is 8, 3 = 11. Eryndir has "bloodied" the sword. Brianna makes a save vs. death. I rolled 1d20, the result is 4 = 4. Brianna doesn't die, but she's that much closer to death. She's failed 2 and has zero successes. Prythurkan moves two squares east, provoking from a sword. I rolled 1d8+1, the result is 6, 1 = 7. Prythurkan does take a fair amount of damage to the face, blooding him. He now flanks the animated armor and attacks with advantage. Attack, Advantage, withholding Damage to see if he smites. I rolled 1d20+5, the result is 2, 5 = 7. I rolled 1d20+5, the result is 16, 5 = 21. Prythurkan lands the attack and expends a first level spell slot to smite the armor. I rolled 1d12+3, the result is 3, 3 = 6. I rolled 2d8, the result is 1, 7 = 8.